NEW YORK - Oct. 17, 2017 - PRLog -- Melodia Women's Choir, New York's premier ensemble for women's choral music led by artistic director Cynthia Powell, announces its 15th anniversary season with Autumn Fire, a program inspired by the fiery colors of autumn and German Romantic composers. A lovely set of motets by siblings Felix Mendelssohn and Fanny Mendelssohn Hensel will be performed, as well as the harp mass Harfenmesse: Missa Advocata Nostra by Johann Kaspar Aiblinger, and Josef Rheinberger's ethereal Wie lieblich sind deine Wohnungen, both works featuring harp soloist Rita Costanzi, formerly a principal harpist of the Vancouver Symphony Orchestra and a solo harpist of the CBC Radio Orchestra. Melodia Women's Choir led by Cynthia Powell, with Mika Nishimura (piano), Rita Costanzi (harp), Meaghan Burke (cello), and Mary Ann McSweeney (bass). Formerly a principal harpist of the Vancouver Symphony Orchestra, a solo harpist of the CBC Radio Orchestra, and a faculty member at the University of British Columbia School of Music, the Comox Valley Youth Music Center and the Symphony Orchestra Academy of the Pacific, Costanzi has established an international reputation as an artist of rare depth, sensitivity and "exquisite virtuosity." She is currently at work on a new one-woman theatrical show with Hershey Felder and a book based on her life to be launched in 2017-18. 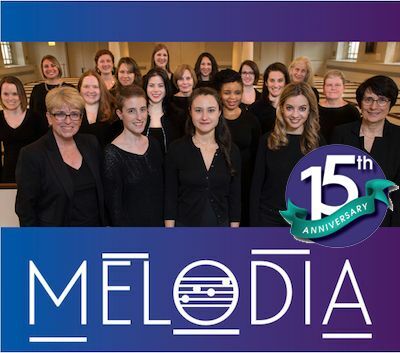 Melodia Women's Choir of NYC Presents "Gloria: Lifting the Veil on Vivaldi's Masterpiece"